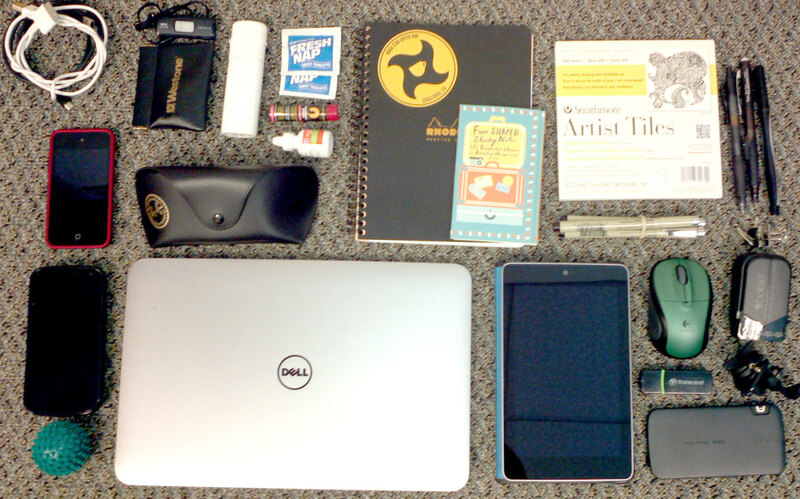 Here are the contents of my bag which I’ll be toting around with me at DevLearn, and it’s pretty much the same thing I bring every event. From top left going down vertically and back up: charging/data cables, ipod touch (4th gen), Galaxy Nexus, little foot massager (believe me, this is useful), flash drive (also have one on my keychain), earplugs, sunglasses, ultrabook (Dell XPS13 running windows 9), hand sanitizer, wetnaps, lip balm (bought this one last year at the Aria), eye drops, Rhodia meeting book (very handy), cutsie sticky notes, Nexus 7 tablet, Artist tile sketchbook (for doodles and notes), fine tipped markers, Logitech wireless mouse, SD card reader, Anker portable battery, a couple of regular pens and mechanical pencil, binder clips, four port AC charger, kinda cheap in- ear headphones. Not pictured – Sony NEX-3 camera with spare battery, Water bottle. Next Update on the little one.